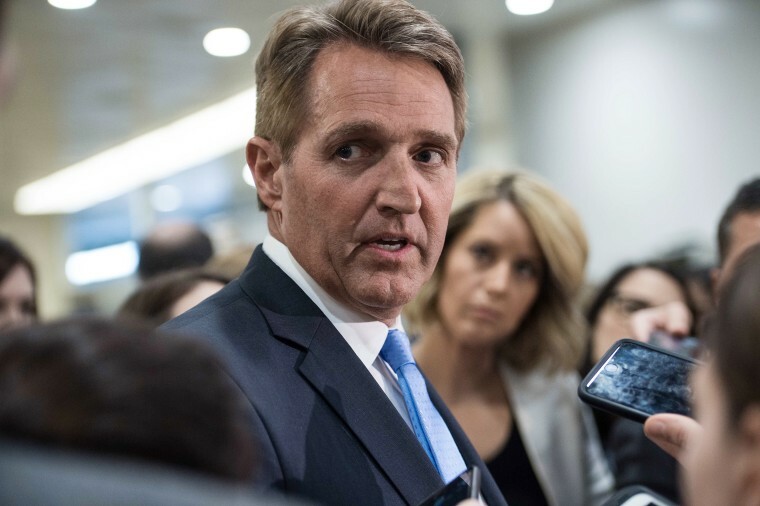 Sen. Jeff Flake, R-Ariz., delivered a speech from the Senate floor Wednesday denouncing President Donald Trump's attacks on the media and comparing his inflammatory rhetoric to phrases used by Josef Stalin, the Soviet dictator. One of Trump's fiercest Republican critics, Flake stunned Washington last October when he announced that he would not seek re-election. His speech comes on the same day Trump said he would give out his "Fake News Awards" to the "most corrupt & biased of the Mainstream Media." However, when asked about the president's "awards" during Tuesday's press briefing, White House Press Secretary Sarah Huckabee Sanders downplayed it as a "potential event." Mr. President, near the beginning of the document that made us free, our Declaration of Independence, Thomas Jefferson wrote: “We hold these truths to be self-evident...” So, from our very beginnings, our freedom has been predicated on truth. The founders were visionary in this regard, understanding well that good faith and shared facts between the governed and the government would be the very basis of this ongoing idea of America. No longer can we compound attacks on truth with our silent acquiescence. No longer can we turn a blind eye or a deaf ear to these assaults on our institutions. And Mr. President, an American president who cannot take criticism — who must constantly deflect and distort and distract, who must find someone else to blame — is charting a very dangerous path. And a Congress that fails to act as a check on the president adds to the danger. But many untruths are not at all trivial — such as the seminal untruth of the president’s political career — the oft-repeated conspiracy about the birthplace of President Obama. Also not trivial are the equally pernicious fantasies about rigged elections and massive voter fraud, which are as destructive as they are inaccurate — to the effort to undermine confidence in the federal courts, federal law enforcement, the intelligence community and the free press, to perhaps the most vexing untruth of all — the supposed “hoax” at the heart of special counsel Robert Mueller’s Russia investigation. Ignoring or denying the truth about hostile Russian intentions toward the United States leaves us vulnerable to further attacks. We are told by our intelligence agencies that those attacks are ongoing, yet it has recently been reported that there has not been a single cabinet-level meeting regarding Russian interference and how to defend America against these attacks. Not one. What might seem like a casual and routine untruth — so casual and routine that it has by now become the white noise of Washington — is in fact a serious lapse in the defense of our country. We are a mature democracy. It is well past time that we stop excusing or ignoring — or worse, endorsing — these attacks on the truth. For if we compromise the truth for the sake of our politics, we are lost.